TopGoldForum is for over 12 years, one of the prime online destination for information and discussion about forex trading, offshore companies, online investments and crypto-currencies like bitcoin. Here you can share your experiences, advertise your business, seek help and make friends. 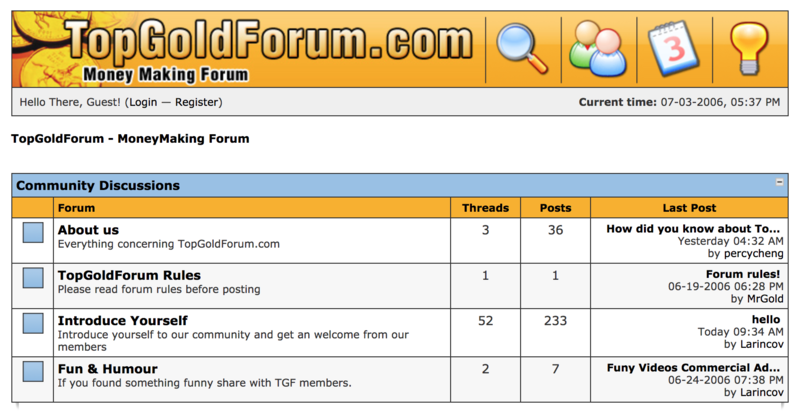 This is the first version of TopGold Forum, created in January 2016. Next version of Top Gold Forum, adopted in 2010. Our Mission is to create a community that can help You Make Money as a TEAM with Like-Minded Money Makers from all over the World. Helping Money Makers build Passive/Residual Income is what we are living for! Dennis is both the founder and the administrator of TopGold Forum since its inception in 2006. He helped hundreds of individuals to make money online and start their businesses. You may contact him using this link. His areas of expertise are Online Business Consulting, Digital Marketing, SEO, Social Media Marketing, Online Payments, and Blogging.